Explore Singapore! 2011: National Monuments Tour with Mark Lee. when: 27 Nov 2011 (Sun), 2.30pm - 4pm. where: Meeting point - Peranakan Museum. - Tan Kim Seng Fountain, Cenotaph and Lim Bo Seng Memorial. - Telok Ayer Chinese Methodist Church, Al-Abrar Mosque, Thian Hock Keng, Nagore Dargah Indian Muslim Heritage Centre. Preservation of Monuments Board (PMB) umbrella. "Monuments - Our Standing History." "Already Famous" 《一泡而红》 movie tickets. Thanks for the wonderful opportunity, I Love Museums! It was an enriching and informative learning experience, with awesome guide - Mr. Mark Lee. It's A Great Great Weekend at ACM! Pack your picnic baskets, and take a trip to the past at the Asian Civilisations Museum! Enjoy the local blockbuster, "It's A Great Great World" under the stars! Set in the 1940s, the movie follows a multitude of characters who had lived, worked, played, and fell in love at Singapore's legendary amusement park, Great World. Don't miss our latest exhibition, "Patterns of Trade: Indian Textiles for Export, 1400 – 1900", and other fun activities. Look forward to a special programme featuring Mark Lee and Suhaimi Yusof! I was at the 26th SEA Games from 13 Nov (Sun) to 17 Nov (Thu) 2011. Team Singapore: [Badminton] FU MINGTIAN (伏明天). "The Singapore Spirit helps me persevere and never give up." Team Singapore: [Badminton] CHEN YONGZHAO ASHTON (陈勇肇). "Always give one’s very best and never give up. That is my Singapore Spirit!" Team Singapore: [Badminton] GU JUAN (顾娟). "To me personally, the Singapore Spirit is perseverance." and THNG TING TING (汤婷婷). .
JOHNATHAN TANG YEW LOONG (郑耀龙). "Unity - that is what the Singapore Spirit is." "Loyalty. Integrity. That is the Singapore Spirit." ‎NEO YU YAN VANESSA (梁语嫣). "Give my best and never give up. That is my Singapore Spirit." "The heart of the Singapore Spirit is perseverance." "The Singapore Spirit is unity as a team always." "Never give up and always uphold the attitude that is the Singapore Spirit!" and YEO ZHAO JIANG TERRY (杨潮江). "The Singapore Spirit means fighting all the way always." YEO ZHAO JIANG TERRY (杨潮江). "The Singapore Spirit means not giving up and always giving your 100%. It doesn’t really matter if you succeed in the end, it’s more about the amount of effort that you put in." and JEFFREY WONG HAO CONG (王豪聪). JEFFREY WONG HAO CONG (王豪聪). "The Singapore Spirit means the nation coming together to support the representatives and giving them the fullest support and best wishes." "Singapore may be a small country but it always stays strong and never fails. To us as a team, the Singapore Spirit is all about Singaporeans coming together as a whole to support one another no matter the circumstances. Giving it all on the court till the final whistle - that’s the fighting spirit we will bring to the Games." with Team Singapore paddler, PANG XUE JIE (庞学杰). "When I see our flag being flown anywhere in the world during competitions, I point to it and proudly proclaim: "That's where I come from!" When I put on the national jerseys in international competitions, I am telling my opponents: "Hey, I'm a Singaporean." When the aircraft finally touches the ground of Changi Airport, I smile at my family and friends; and declare contentedly: "I'm home!" Team Singapore Table-Tennis player - Isabelle Li. Merely 17 years old! Singapore will be hosting the biennial Southeast Asian (SEA) Games in 2015. I was looking through my stuff, and found this "ancient" TransitLink card! Looking forward towards SEA Games 2015! Explore Singapore!, championed by the National Heritage Board, encourages members of the public to embark on fun and fascinating journeys to discover our colourful past, rich heritage, exciting art and vibrant cultures. Aimed at making heritage and museums accessible and enjoyable, Explore Singapore! features an eclectic and unique brew of enriching yet entertaining activities happening at our island's museums and heritage attractions. "Heritage Hop-About" uploaded by yesterdaysg on Nov 8, 2011. Be a part of the inaugural Monument Open House 2011 as 27 national monuments welcome the public for visitation over the weekend! Grab the chance to explore and shuttle between the monuments, or join a tour to learn more about these beautiful buildings. Sign up for exclusive guided tours by our campaign ambassadors Mark Lee and Suhaimi Yusof*! Free Shuttle Bus Service (to participating monuments) operates from 11 am to 5pm on both days, and is limited to 40 passengers at any point in time (first–come, first–served). STAND A CHANCE TO WIN A SONY PLAYSTATION 3 AND WEEKLY PRIZES! Go to that location and snap a picture! Keep checking back the Facebook page for updates as they will select the top creative entries each week to win special prizes. Weekly winners will stand a chance to win the Sony PlayStation 3 Slim (320gb). The 3 most creative and visually appealing entries will be crowned winners of the week! The Armenian Sarkies brothers started a famous hotel in 1886. What is the name of the hotel? The Armenian Sarkies brothers started Raffles Hotel in 1886. Raffles Hotel opened on 1 December 1887 as a modest hostelry run by the Armenian Sarkies Brothers. - With the iconic Raffles Hotel doorman and the Preservation of Monuments Board (PMB) plaque. — at Raffles Hotel, Singapore. The Map of Singapore Museums merchandise is created from an artist’s impression of the key museums and attractions in Singapore’s Arts and Heritage district. The museums that pop in this eye-catching map series are the Asian Civilisations Museum, National Museum of Singapore, Peranakan Museum, Singapore Art Museum and the Singapore Philatelic Museum. The Map of Singapore Museums collection also includes bags, pouch and mug! These items can be purchased at the NHB pop-up retail shops located at the National Museum of Singapore, Asian Civilisations Museum and Singapore Art Museum. The 1st prize was: National Monuments Special Tour (2 pax) + MADE FOR SAM Pigxel. While the 2nd prize was: National Monuments Special Tour (2 pax) + Modern General Tote Bag. A memorial structure was constructed in 1953 as a dedicated tribute to a hero during the Japanese Occupation in 1944. What is the name of that memorial structure? Remembering our hero - This is the view when you bow your head at the Lim Bo Seng Memorial - a memorial structure which was constructed in 1953 as a dedicated tribute to a hero during the Japanese Occupation in 1944. "Major-General Lim Bo Seng (1909-1944) was born on the 27th of April, 1909 in Nan-An, Fukien, China. He came to Singapore at the age of 16. ... Since 1937 he became prominent in anti-Japanese activities. When Singapore fell in 1942 he went to Chungking and on instructions from the Chinese Government, he joined the underground resistance under the Supreme Allied Command Southeast Asia. ... But he was discovered and arrested by the Japanese military police on 27th March 1944. He manfully endured repeated tortures to which he ultimately succomed on 29th June 1944 at the age of 35. He died in the Batu Gajah prison a martyr to the cause of a liberated Malaya and to his loyalty to the comrades on the 13th January 1946. He was buried with full military honours in Singapore. Erected by The Lim Bo Seng Memorial Committee, 29th June 1954". — at Lim Bo Seng Memorial. I like the 1st prize photo entry, using 2 hands to form a heart-shape, with the memorial in the center of the "heart". This mosque is considered the national mosque of Singapore and it was named for Sultan Hussein Shah. What is the name of the mosque? The Sultan Mosque holds great significance for the Muslim community, and is considered the national mosque of Singapore. Also known as Masjid Sultan, it was named for Sultan Hussein Shah. The mosque was first built between 1824 and 1826, and was replaced by the current building between 1924 and 1928. It was designated a national monument in 1975. (source: Infopedia) — at Masjid Sultan. Since time immemorial, Man has always fought for that bag of gold. Even in today’s digitalised finance, this symbol of wealth, power and greed still has a powerful hold on our unconscious instinct to survive. Saving is a virtue, but to what do we accumulate wealth for: And for how much will we destroy for it? The bag of gold is made deliberately without a release plug. With the words “If I sold my soul for a bag of gold” from a song by the band Bright Eyes, it puts to question immediately if one should break an object of accumulated coins (and memory) for something to buy. The finale! The photo with the most ‘Likes’ wins 320GB PlayStation 3 Slim. After the announcement of the 320GB PlayStation 3 Slim winner, they will randomly select those who has ‘Liked’ the photo with the most ‘Likes’ to win The Warrior Figurine (white)! This collection is inspired by Justin Lee’s artwork of a small army of terracotta warriors, graceful fairy-like maidens and cranes. Justin’s artwork expresses his views on Singapore’s society, highlighting issues of national identity, commercialisation and consumerism. His signature “Double Happiness” motif is a symbol of Singapore’s successful marriage between the East and West. Justin’s art installation blends Western pop art with traditional Eastern imagery, to give a new iconographic interpretation of a work that is decidedly Singaporean. The collection includes Modern General cup & saucer set, dual tone mug, coin bank, warrior figurine to iPhone 4 cover. These items can be purchased at the NHB pop-up retail shops located at the National Museum of Singapore, Asian Civilisations Museum and Singapore Art Museum. Voting ends 4 December 2011 (Sunday), 11.59pm. I Love Museums (Monday, December 5 at 11:38am) - "Hello all! Congratulations to Shichang, who is now a new owner of the 320GB PlayStation 3 Slim! The photo received 198 'likes'! Please check your inbox soon Shichang. We will announce the winner of The Warrior Figurine (white) soon. Stay tuned!" Thanks everyone for liking the photo, and those who 'share' to ask your friends to vote too! (you know who you are) This would not be possible without each one of you. We were neck and neck with the next top photo, and in the end we won by a narrow margin. Thank YOU from the bottom of my heart. 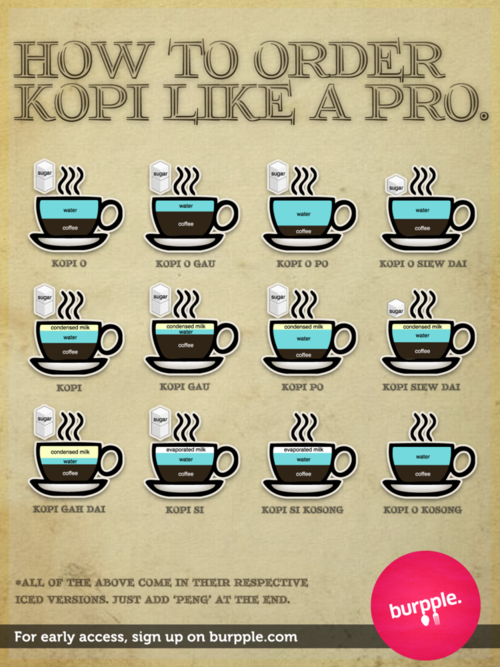 Always wanted to order authentic kopitiam kopi (coffee) like a pro in Singapore? Now you can learn how to faster than you can say "Uncle Kopi Si Kosong Peng!" with this exclusive Burpple guide. Kopi Gah Dai, Kopi Si, Kopi Si Kosong, Kopi O Kosong. Teh Gah Dai, Teh C, Teh C Kosong, Teh O Kosong. "A generic term for a variety of dishes of South or Southeast Asian origins." Curries typically contain 3 main ingredients (and a whole bunch of others): Cumin, Coriander, Tumeric. Anglicised Tamil Word - கறி (kari), meaning 'sauce'. The Chinese eat their curry with noodles. The Japanese eat curry on average of 125 times a year. Ingredients in curry help prevent diseases like colon cancer and Alzheimer's disease. Curry also stimulates the release of endorphins, which is a great aphrodisiac. Mr & Mrs Curry: Curry is the 313rd most common name in America. Curry is a common surname throughout Ireland and Scotland. There are 3 places in Cornwall bearing the name 'curry'. Burpple is the mobile social food diary, the easiest way to remember, share and explore your favorite meals with your friends. They bring word-of-mouth food recommendations to the mobile, making trusted opinions available anytime, everywhere. It redefines the interactive experience of food and people using a mobile phone. Join them at www.burpple.com in connecting the world's social food graph.